At WITNESS we are all in on the power of video. After almost 25 years in existence, we’ve come to believe that how and why a video is created is just as important as what it captures. 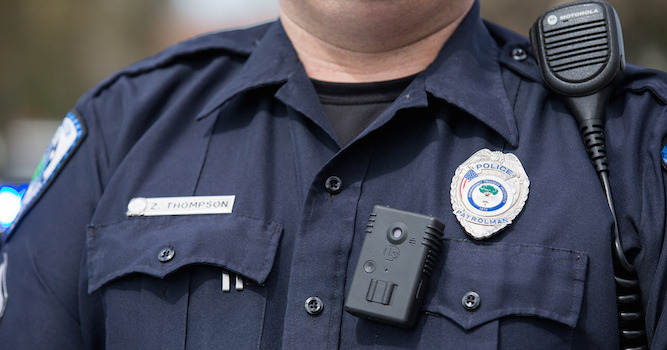 That’s why we’ve watched closely as military and police departments around the world have increasingly integrated video into their operations by adopting body-worn cameras (“bodycams”). Now it’s the largest police force in the US, New York City, that is expanding its use of bodycams, from about 50 officers with cameras in the last two years to 1,000 this summer, with the plan to eventually roll out something like 20,000 cameras citywide. And this time they’re asking New Yorkers for their input by Sunday, August 7, so we’re joining advocates and residents around the city to voice our opinion. There are three main points we are going to emphasize in our comments. First, we note that this process is far from sufficient. An online-only form put out by a law school and with unclear follow-up is not how you get representative feedback from the people most likely to end up being filmed. This exact point was one of the first things Communities United for Police Reform put forward in their testimony last year: “Communities who are directly impacted by discriminatory and abusive policing must have meaningful and structured input in the development, implementation & evaluation of any body worn camera program.” No one is better placed to answer the questions that will determine whether more video by police leads to more justice (or just more surveillance) than those who are the most policed. Second, our work with video has taught us that it is always just one piece of a larger equation – for us, whether footage is used as advocacy or evidence, it’s effective not as a primary strategy on its own but as an asset that bolsters existing organizing, strategy, and legitimacy. The same is true here, and it’s important that bodycams are framed within a larger context so as to avoid preempting or distracting from discussion of the real reforms that are needed at the NYPD and nationwide. You can’t fix a political problem with a technical solution, and even a perfect bodycams program – if there is such a thing – wouldn’t be satisfactory. For example, the bodycams pilots in New York grew out of a court order following lawsuits challenging stop-and-frisk practices, and today New Yorkers are still fighting for common sense reforms to stop-and-frisk like the Right to Know Act. And while the NYPD is ramping up their use of video, a real push for accountability would include a corresponding call for the public to pull out their own cameras during police interactions; an NYPD that wanted to be held accountable would be begging the public to film and setting up processes for reviewing civilian-shot footage rather than discouraging citizen media and arresting those who assert their right to record. It allows officers to view footage of incidents before making any official statement, even in incidents when the officer used deadly force. It does not provide complainants access to the footage relevant to their complaint. There are no safeguards against cameras becoming a tool for surveillance, such as limits on the use of biometric technologies like facial recognition software. Those three points sync with the well-documented BWC Policy Scorecard published by a range of civil rights groups (and just updated this month). Of the eight issue areas they’ve identified, New York falls short on five, including the three points MAG-Net highlighted above. Additionally the scorecard points out a lack of clarity on retention of footage and the lack of a published policy governing the use of the cameras, the latter of which will hopefully be remedied at the end of this review process. One question that the NYPD survey doesn’t ask and isn’t addressed in the scorecard has to do with what happens if an officer doesn’t follow the regulations; what kind of disciplinary action will be taken if an officer doesn’t record an interaction where they are accused of using excessive force, for example? Those are our initial thoughts, and now it’s your turn to weigh in. If you’re a New Yorker, submit comments or answer the NYPD survey here. If you’re not, make sure your friends in New York know about this process, and make sure you’re engaged with your own city, because most major cities in the US, and many others around the world, are at least considering the use of bodycams. See more of our thoughts about how bodycams can never replace the value of citizen witnessing. Explore our analysis and resources on police violence in the US. Read an overview of the proposed NYPD policy here and the full policy here (pdf). Submit your thoughts about the NYPD’s use of bodycams. See how the fifty largest cities in the US fare on the BWC Policy Scorecard. Join the MAG-net open letter to the NYPD. Follow groups like the Center for Constitutional Rights, Communities United for Police Reform, and the Movement for Black Lives to see what they’re saying about bodycams and NYPD reform. Featured image via North Charleston on Flickr.